Here are some screen shots I took with the new trap and the new charm in Claw Shot City. As you can see, there is no added benefit beyond the original stats of the charm when equipped with the new Law trap in Claw Shot City. That’s rather disappointing. The Claw Shot Base also does NOT receive it’s bonus if you use it with the new trap. Now let’s take a look at SLAC2. Obviously, if you have SLAC2, it is still a better trap to use. 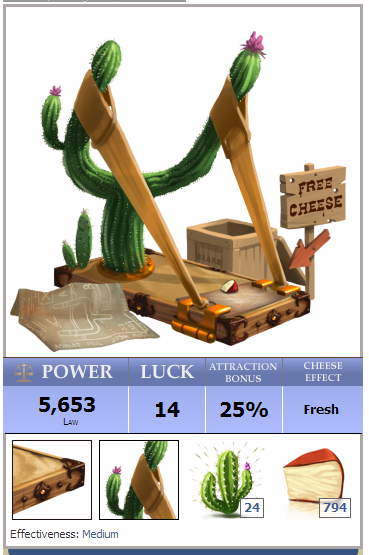 The power bonus of the Claw Shot base coupled with the Super Cactus Charm are simply too much to overcome for the new Law trap. Personally, I think the Claw Shot Base should give its bonus in Claw Shot City regardless of the trap. I also want to take this opportunity to re-state my stance on this new trap – below I said this new Law trap was the best Law trap in the game due to the luck factor. However, after looking at the statistical modeling and taking the CSC bonuses into account, I can’t say this as emphatically anymore. It is still a good trap, and honestly probably should be used ON THE TRAIN (before you get the train traps) instead of SLAC2, but SLAC 2 will out perform The Law Draw in Claw Shot City every time, regardless of the base. CRE says Law Draw is more effective than any of the 3 specialised traps in the respective train sections tho. I do not have much experience in this area yet but it seems Law Draw makes the 3 special traps obsolete. Good call about SLACII in the city tho, will work on that trap after all.